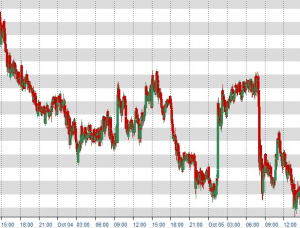 In the UK overnight trading session, a further blow to the Australian Dollar was dealt by the retail market, further highlighting the importance of the decision by the Reserve Bank of Australia, RBA, to hold interest rates at 1.50 percent. Philip Lowe, governor of the RBA, claimed the bank would wait until consumer spending strengthened and wage growth increased before reviewing the rate. This data dependency exacerbates market reaction to macroeconomic statistics releases. Data from the Australian Bureau of Statistics (ABS) showed retail sales dropped by 0.6 percent in August, down for a second month in a row, despite a consensus forecast for a 0.3 percent rise. All Australian retail categories saw a decline in sales through August with the exception of department stores, which saw a small increase. In the worst decline since October 2010, July and August also showed a 0.8 percent, highlighting the fragility of the Australian economy. The decline in retail spending has been attributed to low real wage growth, which has halved in the last five years. Coupled with rising debt in the Australian housing market, the ability for consumers to spend has been limited. These figures alone should not be read into too deeply. However, they achieve more bearing when coupled with retail figures for August. This paring reveals a more systemically unhealthy economy with car sales, as well as poor real estate data, painting a bleak picture of the Australian economy. With the decision to raise interest rates in Australia proving to be pivotal, the RBA is assigning excessive impetus to macroeconomic data. Therefore, worse than expected retail performance results are one of the factors holding the RBA back from raising interest rates. The interest rate is a monetary policy tool used to manipulate the macroeconomy. Interest rates represent the reward for saving and the cost of borrowing money within the domestic economy. Philip Lowe most recently announced that the global economy really is firming up. This followed a string of developed markets central bankers declaring that the macroeconomic risk across the world is declining. The concern within the Australian economy is that idiosyncratic national risks still exist. In effect, therefore, the Australian economy is not feeling this recovering. The disparity between the global and Australian economies underlies the exchange rate sensitivity to a variable that really shouldn’t matter on the national stage; retail data. The Australian Dollar weakened against the Pound Sterling and US Dollar during the data release at 1:30am BST. The weakness derived from retail data briefly undermined the week long high the Australia Dollar was trading at, at the point of release. This data helps illustrate an underwhelming Australian economy, further highlighting the cautious position the RBA is taking in holding interest rates, predicted to last until next year. The move to hold interest rates, leaving them at a record low, acts to disincentivise outside investors from increasing their exposure to the domestic currency and economy, whilst also preventing confidence in the economy from building. Only a maturation and elimination of dwindling confidence concerning the Australian Dollar will correct against the Aussie Dollar’s relative weakness against the US Dollar since mid-2011.